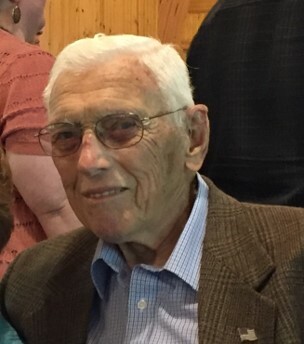 William “Bill” Grevelding, age 91, of Paw Paw, passed away December 5, 2018. He was born August 11, 1927, in Syracuse, New York, to William and Regina (Solinski) Grevelding. He is survived by his wife of 66 years, Jeanne (Kleckler) Grevelding, his three children, William Grevelding, Margaret (Dana) Stiffler, Thomas Grevelding, two grandchildren, Evan (Crystal) Stiffler, Edward (Jordi) Granger, and two great-grandchildren, Scott Stiffler and Ana Smith. Bill was preceded in death by his mother, father and two sisters. Bill was a veteran of World War II, discharged in 1946. He achieved a Bachelor’s degree in Horticulture from Cornell University, graduating first in his class. Bill started his career as a teacher in Warsaw, New York where he met the love of his life and was married to Jeanne on July 12, 1952. He joined Welch Foods – National Grape Co-op as a Field Rep in 1954 and stayed with them until he retired in 1991. Bill belonged to the Knights of Columbus, St Vincent De Paul Society, Kiwanis, Michigan Grape Society, Michigan Cranberry Association, St. Mary’s School Board, United Charities, Field Man’s Association and was the Paw Paw Library Treasurer. He enjoyed bowling and golf, participating in leagues for many years. The family will receive friends on Friday, December 14, 2018, beginning at 4:00 PM until 8:00 PM at the Adams Funeral Home, 502 West Michigan Avenue, Paw Paw, with a Recitation of the Rosary at 7:00 PM There will be an additional viewing on Saturday, December 15, 2018, at 10:00 AM at St. Mary Catholic Church, 500 Paw Paw Street, Paw Paw. Funeral service to follow at 11:00 AM. There will be a small graveside service following the church service and then a luncheon at St. Mary School. Memorial donations may be made to St. Vincent De Paul Society through St. Mary’s Church, Paw Paw.